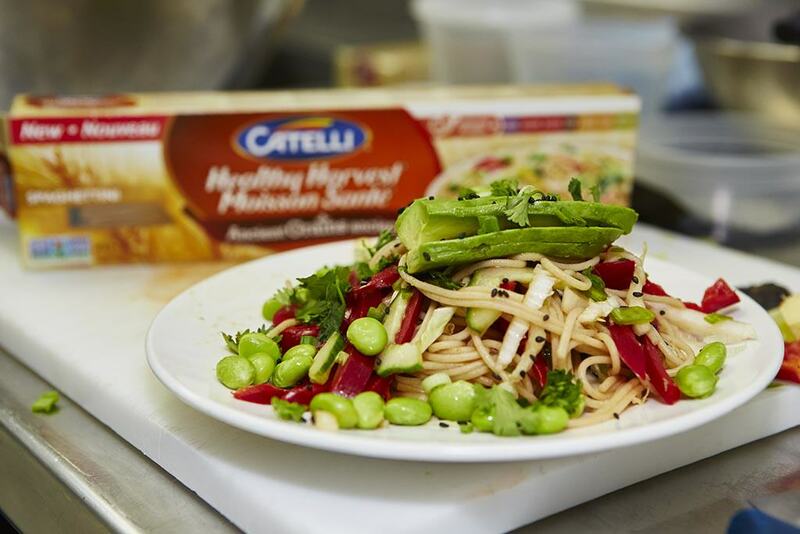 Catelli Healthy Harvest Ancient Grains with Chef Lynn Crawford + Giveaway! 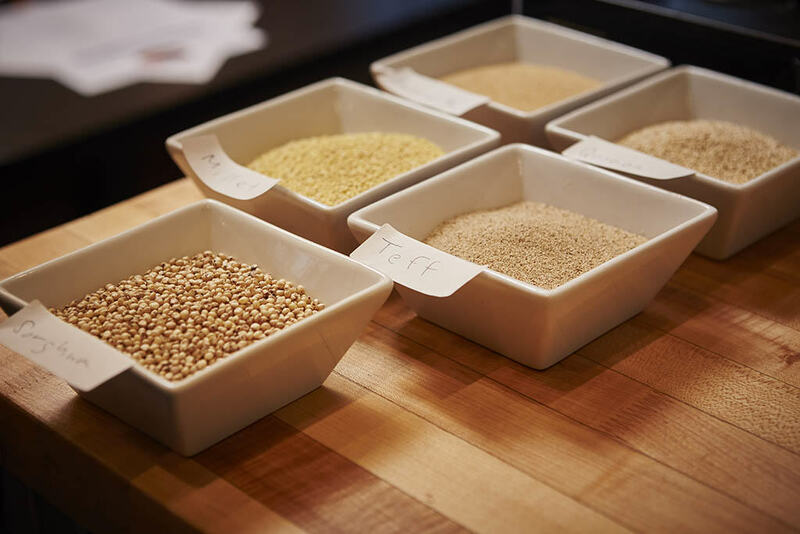 Ancient grains are all the rage these days, appearing in staples from simple flours, to breads and cereals. Now Catelli went a step further and introduced to us their new dried pasta – Healthy Harvest® Ancient Grains. There’s a giveaway involved at the end…so please keep reading!! 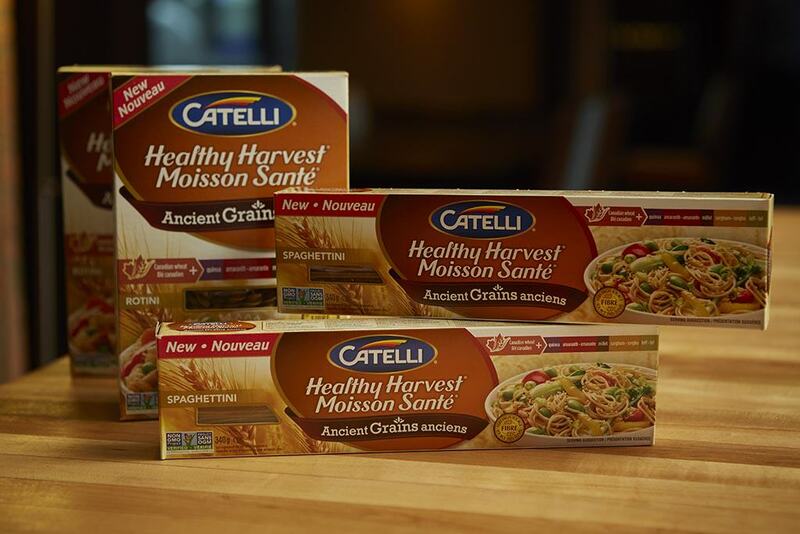 Catelli® Healthy Harvest® Ancient Grains pasta blends 100 per cent Canadian whole wheat (Go Canadians!!) with five wholesome ancient grains: quinoa, teff, amaranth, millet and sorghum. Certified GMO-free (NON GMO Project Verified), Catelli® Healthy Harvest® Ancient Grains pasta is available in three cuts – Spaghetti, Spaghettini and Rotini. 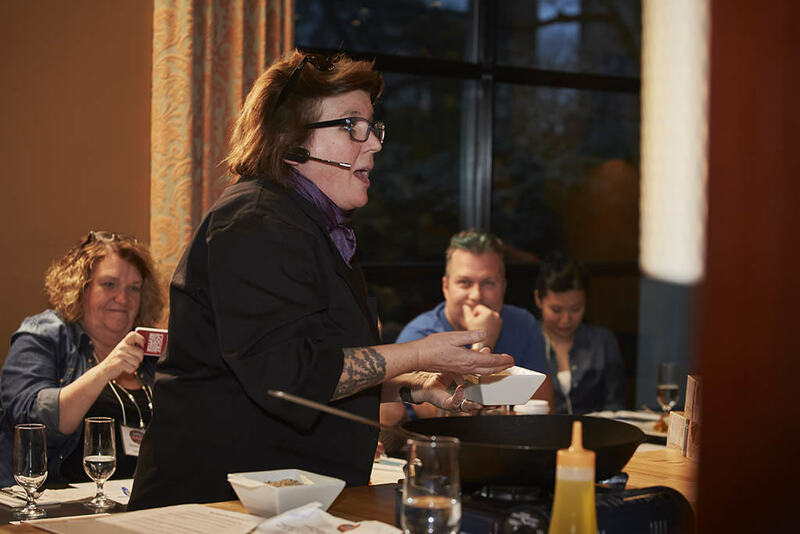 Catelli had enlisted the food expertise of celebrity chef Lynn Crawford to help launch the new line. 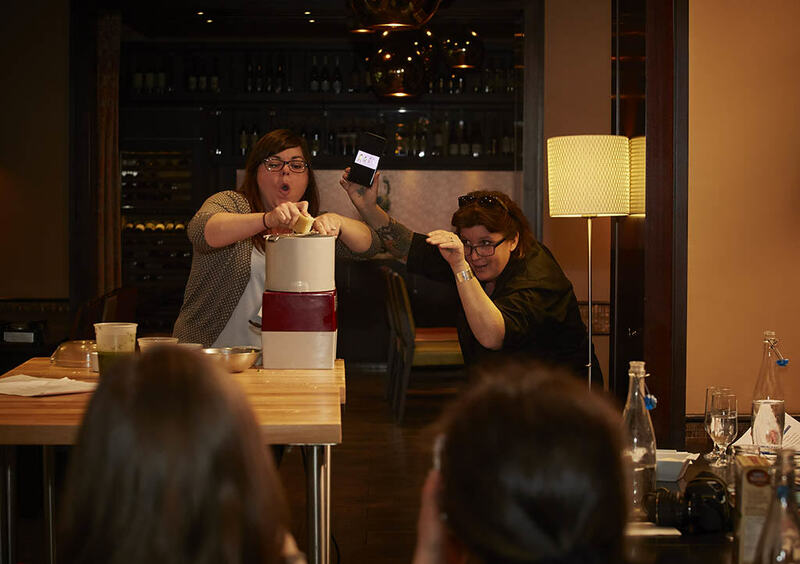 I was one of the lucky bloggers who got the chance to meet Chef Lynn (who was HILARIOUS by the way), learn about the product, and to take home the recipe she had specifically created for the Healthy Harvest Ancient Grains pasta. 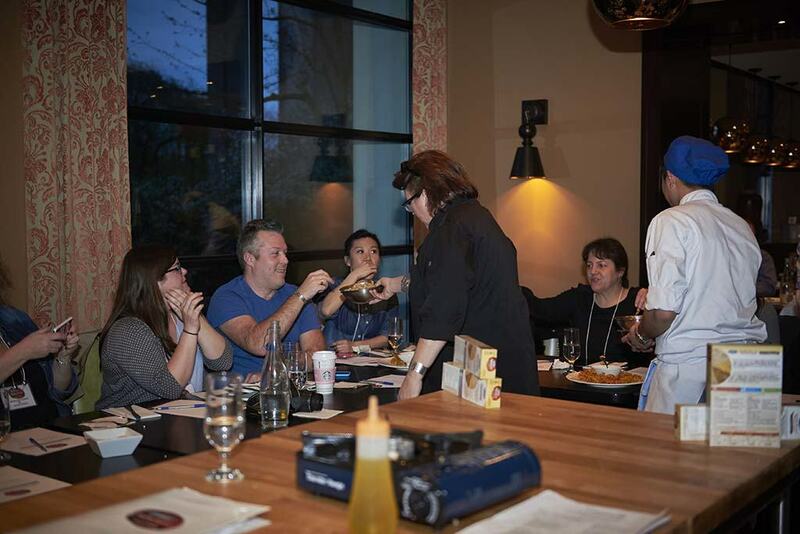 This all took place very appropriately at the Pacific Institute of Culinary Arts near Granville Island. There were some very enthusiatic and entertaining demonstrations (one of which Chef Lynn had us all sing “It’s all about the Basil!” while having a volunteer dance with her while making pesto), and a few tastings. We first had Catelli’s Healthy Harvest Ancient Grains rotini plain but cooked for different amounts of time- 7, 8, and 9 minutes. I prefered the texture of 9 minutes the most. There was no discernible flavor or taste to the plain pasta, which translates to the possibility of any sauce pairings you might like. 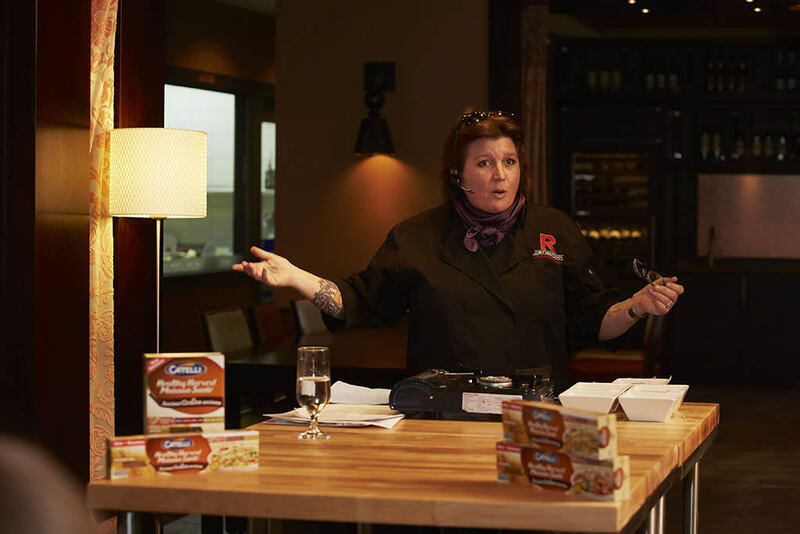 Next, we tried the Healthy Harvest Ancient Grains rotini with Chef Lynn’s marinara sauce. Then, the spaghettini with her pesto sauce. I found the texture of Catelli’s Healthy Harvest Ancient Grains pasta to be between white and whole wheat pasta. In that it’s not as smooth as white, which is to be expected, but not as gritty or brittle as whole wheat pasta. I’m sure that’s a welcome thought to pasta lovers everywhere, who would like to eat healthy but also try to minimize the sacrifices in texture healthy eating brings. After all that, we were all led into the learning kitchens to our own stations, to recreate the Chilled Noodle Salad with Ginger Wasabi Dressing dish she concocted. For a limited time, you can click here for discount coupons for Healthy Harvest Ancient Grains pasta, which retails for $3.29. Catelli’s was kind enough to sponsor a giveaway. One lucky reader will win a year’s supply of Healthy Harvest® Ancient Grains pasta. You’ll receive additional entries for referring through your different social media accounts also. Contest will be held for 2 weeks until April 6, 2015 at 11:59pm. Open to Canadian residents only. All prizes and winners will be handled solely by Catelli’s. Good luck!! *UPDATE Apr 8, 2015* I have picked the winner! You will be receiving an email from me soon! Thanks everyone for entering!!! Im overjoyed to hear about this new product! I usually feel guilty or heavy after eating pasta but I can actually feel good about all the nutrients I will be getting and it sounds like its easier on the digestive system! I also don’t eat a lot of meat so Im always looking for other food sources rich in iron. I agree with you Nicole! I truly think this is the first of its kind in the dried pasta world, as it’s not mixed with brown rice. Kudos to a smoother texture too! Now if only they’ll release it in more cuts! We actually talked about that at the event! For someone reason when I go to the link, it shows that I already have an entry. I’ve never entered before. Even with my cache/cookies cleared it shows me as being logged into the contest widget. I’ve checked on your entry and am going to send you an email. Let me know how you want to proceed! Where can I get this pasta? My grocery store doesn’t carry it. Hi Mary! According to Catelli, they’re now available in major grocery stores. It does not seem entries are adding up, I receive 2 a day and it says 2 and every day I come back and it’s at 0?? Hi Doris! I’m a bit confused…what are you receiving 2 a day of?